Getting directions is one of the most popular features on Google Maps, whether it be for driving, walking, biking or transit. Yesterday Google Maps launched a new feature that allows you to bring your upcoming trip to life, by allowing you to preview your route in 3D. 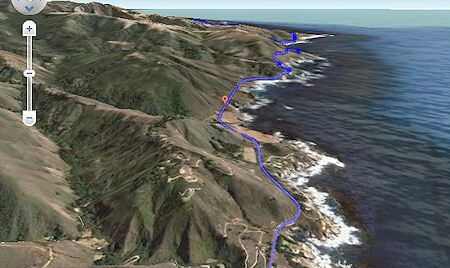 Using the 3D feature you can get an aerial view of the route, as if you were in a helicopter flying above the road. To preview your own route is as simple as clicking on a button. Start by entering your starting point, destination, and mode of transport. Then, just click on the '3D' play button. The map will switch to Earth view and automatically start flying you along your recommended route. It doesn't work particularly well yet. One route I tried the digital mapping has the road some distace from where the aerial photography shows it. Having driven that road I can tell you that it's the map that's wrong, not the photographhy. My satnav thought I was driving some distance fromt he road. So not strictly speaking Google's fault that it doesn't work right, but it still doesn't.